Why do I receive a "Low Memory Warning"? First of all let us clarify that the memory being referred to is RAM on your device. It is not storage space. To be clear if you purchased an iPad 16GB - the 16GB is storage space or disk space - not RAM or memory. Unfortunately Apple has tried to hide the concept of RAM from the end user - so most users do not even know how much RAM their iOS device has. An iPad 1 has 256MB, an iPad 2 and iPad mini has 512MB and an iPad Gen 3 and 4 has 1024MB. So why does the warning appear? This is generally because you have too many programs open at once. If you close some Apps that are currently open, then you will free up RAM on your device. 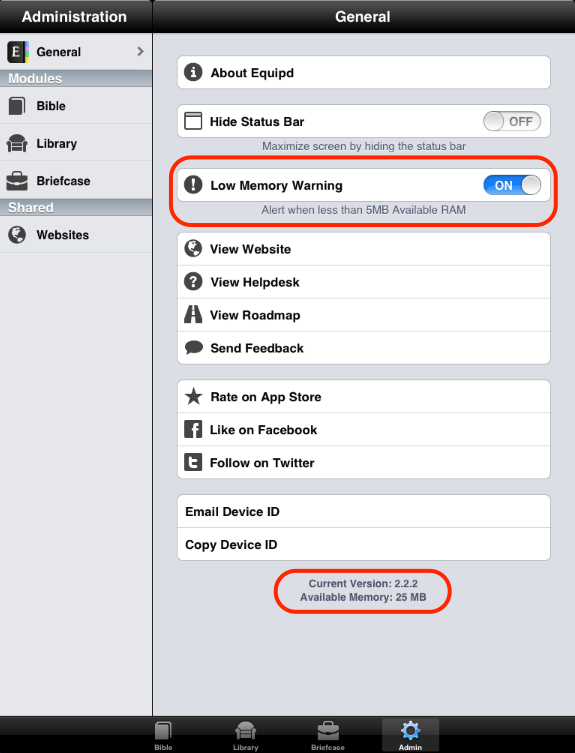 For example apps like Mail or Safari with lots of tabs open can use up a lot of memory. If you close these then you have more RAM free on your device. You can see how much RAM is currently "available" or "free" on your device at the current time by going into Equipd > Admin Tab > General > and scrolling right to the bottom. Look for "Available Memory" (see screenshot below). The higher the number the better. However keep in mind that this number can get really low, eg less than 10MB, and your device will still function OK most of the time. It is just not ideal. Some users have had issues with their device running out of memory and crashing the device, or corrupting Equipd. This Low Memory warning can help you to avoid this issue. However if you just find this alert annoying, or are still not sure what it means, then just turn it off in Admin > General (see screenshot).